Welcome to the Holiday Inn & Suites Huntington - Civic Arena. Situated in the heart of downtown Huntington, WV, this hotel offers a convenient downtown location next door to Big Sandy Superstore Arena, Pullman Square and many of Huntingtons most popular restaurants and shops. This hotel places you in close proximity to most of the city's major attractions as well, including Marshall University, Ritter Park, Harris Riverfront Park, Camden Park, Heritage Farm, and the Huntington Museum of Art. This Huntington hotel is also near a number of hospitals, including Cabell Huntington, St. Marys, and the VA Medical Center. Industrial companies are also nearby, such as Marathon Petroleum, CSX, Amazon, Braskem, Corps. of Engineers, and Special Metals-Precision Castparts. Our corporate travelers enjoy their extended stays in our luxurious suites. With an onsite conference space seating up to 40 people, our hotel has the premier location for small meetings and conferences in Huntington, WV. 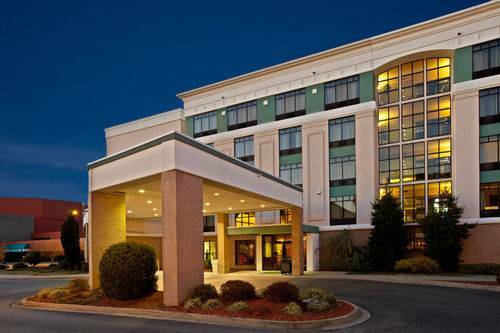 Modern amenities and comfortable accommodations await our hotel's guests in Huntington, WV. Our hotel features the largest rooms in the area and each guest room is equipped with a microwave, refrigerator and coffee/tea maker. Our full-service hotel has outstanding amenities, such as a state-of-the-art fitness center, indoor pool, laundry facility, and a free shuttle to Tri-State Airport or Amtrak station. We alsoffer room service at our restaurant, River Cafe. Small meeting room space for approximately 30 people. Great for small corporate meetings. Coffee and food provided at a charge. Children's program - Indoor pool. Located beside the hotel is Pullman Square where you will find a variety of shopping and fun exciting adventures along with many dining choices to suit your preferences. Step back in time with a guided adventure into days gone by -- a time of one-room schoolhouse, blacksmith shops, country stores and log homes.